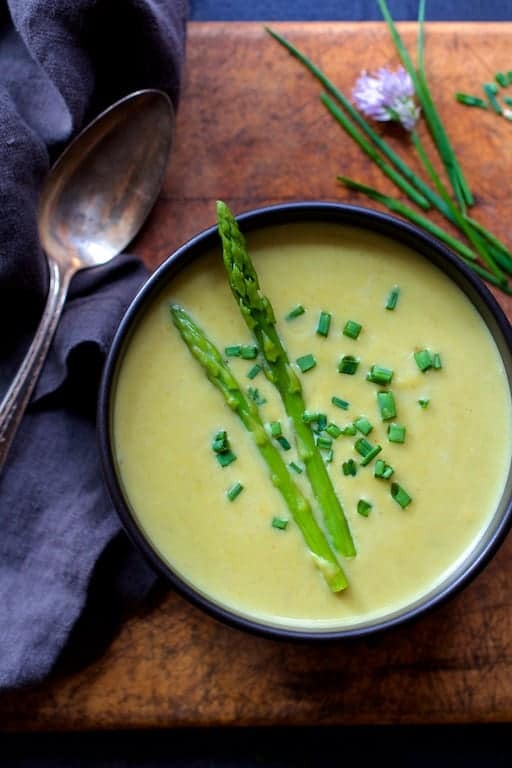 Cream of Asparagus and Leek Soup with Curry makes a beautiful starter for an elegant late spring dinner or as part of a light lunch. Today is Memorial Day. If you’re a veteran or currently serving in the Armed Forces, let me start by expressing my heartfelt gratitude to you and your family for your service and sacrifice. Freedom is not free! Your service and sacrifice allow us to freely express ourselves here on the internet and any other way we choose. So, THANK YOU! Memorial Day is often called the “unofficial” start of summer and wonderful garden produce is right around the corner. However, I’m still not over asparagus yet because it’s truly one of my favorite vegetables. We’re also continuing to pick a few spears here and there from our backyard patch. As mentioned in a previous post, I was “gifted” several pounds of beautiful ramps by my nephew by marriage (who is now my favorite nephew… 🙂 Hi, Blake!) Ramps, also called wild leeks, don’t last long; they only last about a week refrigerated. I pickled some and used the rest in this silky and flavorful Cream of Asparagus and Leek Soup with Curry. Pureed vegetable soups are one of the easiest and most forgiving soups to make. Your knife skills can be next to nil and produce doesn’t have to be pretty. 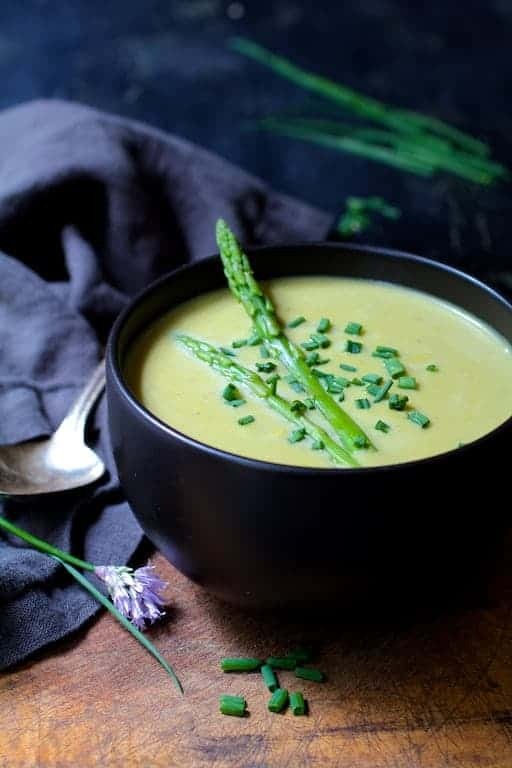 You can use end-of-the-season produce and after it’s pureed you’ll still end up with a gorgeous, luxurious soup such as this Cream of Asparagus and Leek Soup with Curry! Now, not everyone has a wonderful nephew who sends them fresh ramps, so use regular leeks if you don’t have a source for ramps. Onion, spring onion or several bunches of scallions will also work. If you’re not a curry fan, you can definitely leave it out and you’ll have a lovely Cream of Asparagus and Leek Soup. Or, start with a small amount of curry and add more to taste. Also, this is NOT a heavy cream of asparagus soup! There’s only a half cup added at the very end and you can use half-and-half if you’d like. You can puree this soup in a food processor or blender, however, an immersion blender is the easiest and safest way to puree anything. Be careful with those hot liquids! I’ve used almost every brand of immersion blender on the market in my personal chef business and recently went back to Braun. (Affiliate link.) I know… how fickle can a person be? Nothing lasts forever, but after wearing out way too many others, I decided to try Braun again. Just bein’ real folks! Love asparagus? 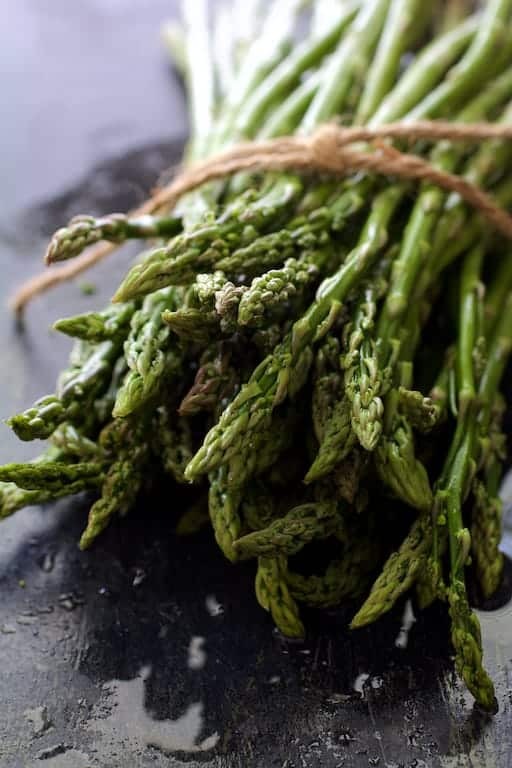 Be sure to try my other asparagus recipes! Reserve 12 nice asparagus tips for garnish. Prepare an ice bath. Bring a small pot of salted water to a boil. Add the asparagus and cook 5-10 seconds just to blanch it. Transfer to the ice bath to cool. Pat dry and set aside. Heat butter and oil over medium-high heat. Add the ramps/leeks. Reduce heat to medium-low and cook 6-7 minutes or until softened. Add the asparagus and potato and saute briefly or until the asparagus turns bright green. Add the curry powder and garlic and stir until the garlic is fragrant. Add 4 cups of the chicken broth. Bring to a boil, cover slightly then reduce heat to medium-low. Cook 20 minutes or until asparagus and potatoes are very tender. Add the cream. Using an immersion blender, puree the soup until smooth. Add additional chicken broth if the soup is too thick. Transfer to bowls and garnish with the reserved asparagus tips and chopped fresh chives. Has anyone tried this chilled? Hi, Les, Not that I know of, but I would think it would be great! It does tend to thicken up a bit when cold, so you would need to adjust for that. Thanks so much and hope you enjoy! What a beautiful recipe, Carol! I’m also in the club of trying to get my asparagus fix even though their season is *technically* over. As long as I see them at the market, they are on my menu every week! This will be a great addition to my repertoire. What a gorgeous looking and tasty soup this is! Unfortunately, we’re not lucky to have ramps, but leeks are a good alternative! And yes to the addition of curry! 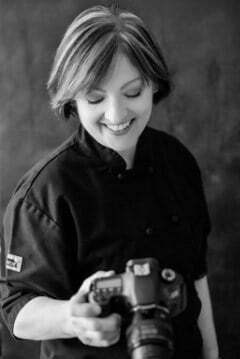 Thanks, Nicoletta! Leeks can definitely be used instead. Hope you enjoy!